This is a 12 block series "From My Scrap Basket" each block measures 9"x12". 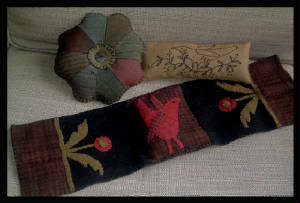 They can be used alone or put together for a table runner or large wall hanging. There are limitless possibilities. The cost is $8.00 plus $2.00 s&h for the paper pattern. I am also offering these 12 as digital downloads, just pay through PayPal and I will email you a pdf file for you to download and print that day. The cost is $8.00. Make sure to email me the name and either the SB number for the paper pattern or the DD number for digital download. "Family" A wonderful gift to give! The finished size is 10"x18". The cost of this pattern is$8.00 plus shipping & handling. Order pattern APOW 412. Needles-n-Pins is a three in one pattern! In this pattern you will have directions to make one, over the arm weighted pin keep (6"x20") one,octagon pin keep (7") and one embroidered pin keep (3"x8"). The cost of this pattern is $8.00 plus shipping and handling. Order APOW 946. This is a pillow made in wool. It could also be made in wool felt! The finished size is 11 1/2"x18". The cost is $8.00 plus shipping and handling. Order APOW 947. APOW 933 "WOOL FLOWER BASKET". The cost of this pattern is $8.00 plus shipping and handling. "UNDER THE STARS" I love the simplicity of this pattern! This is an easy one to make longer if you wanted to, just add more birds and more flowers! I just added a simple border but you could put tongues on the end if you like! 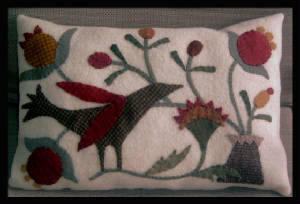 The finished size is 10 1/2"x26 1/2". Order pattern APOW 935 "UNDER THE STARS". The cost for this pattern is $8.00 plus shipping and handling.